Orwell celebrated Queen Elizabeth's Silver Jubilee in grand style with three days of entertainment for all ages. A Jubilee Committee was formed early in the year and began raising funds in March with Bingo in the Village Hall, a jumble sale, plant stall and teas at the old Council School, and a Pippa Dee Party. 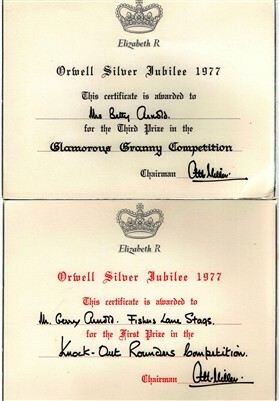 The whole cost of Orwell's celebrations was covered by these events, and the Jubilee committee still had £170 in hand when all expenses had been met. In the week preceding the Jubilee preliminary rounds of 6-a-side football, rounders and cricket matches were held on the Recreation Ground, and a Jubilee Book Fair and talk on the subject of children's books took place at Petersfield School. Houses all round the village were decorated appropriately, ready for judging on Monday. Sunday had been a dignified tribute to Elizabeth's twenty-five years as Queen, but on Monday and Tuesday Orwell really let its hair down with a Carnival Parade, led by the Carnival Princess, children's sports, a Clunch Pit BBQ and a Dance in the village hall. Contestants in the Miss Orwell and Glamorous Granny competitions were advised to wear 'whatever they felt most comfortable and attractive in.' No doubt they were very demure by today's standards, although Miss Smith (below) is showing a daring amount of knee! The Carnival procession included floats, decorated bicycles and prams and Orwellians in fancy dress. 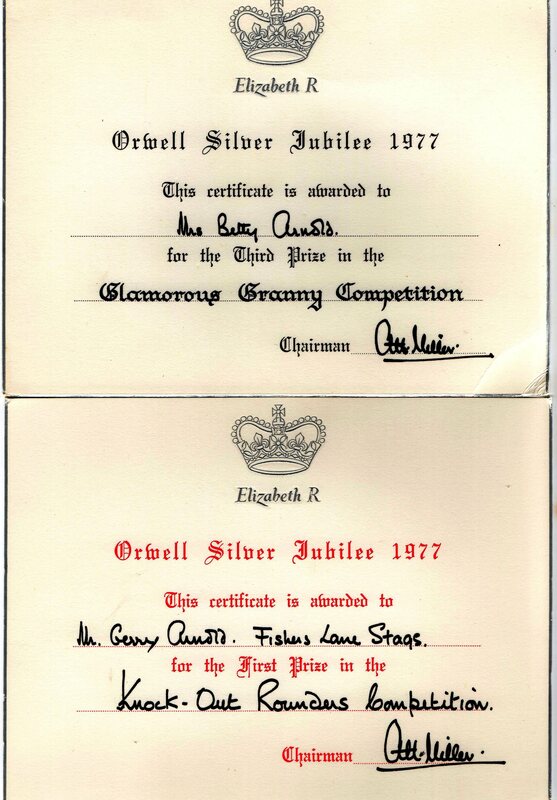 Miss Orwell had the task of presenting numerous awards to the winners of the many Jubilee competitions, including the 6-a-side football tournament and the cricket and rounders matches, and Cliff Bullen, Chairman of the Parish Council, presented Jubilee crowns to the village children. The planned finale to the Jubilee was the lighting of a bonfire in the Clunch Pit at 10.pm on Tuesday evening. The Orwell Bulletin for September 1977 records that "we set an ambitious programme, and we managed, in spite of the weather, to carry it all through". However, the Bulletin carried no pictures, and no descriptions of the celebrations. Films, slides and photographs were displayed in a post-Jubilee evening event in the village hall and some of these must still be hidden away in Orwell homes. Please contact Orwell Past & Present with any memories or photos you may have, and help us to complete our record of this historic event. The Royston Crow carried a lengthy report of the celebrations, listing all the competition winners. Click on the thumbnail picture here to read the details. This page was added by Sue Miller on 28/05/2013. What a surprise to see the clipping from the 1977 Royston Crow! I remember being awarded a special certificate for my fancy dress 'doll in a box'.